Vertebrate Morphology Conference Time! | What's In John's Freezer? 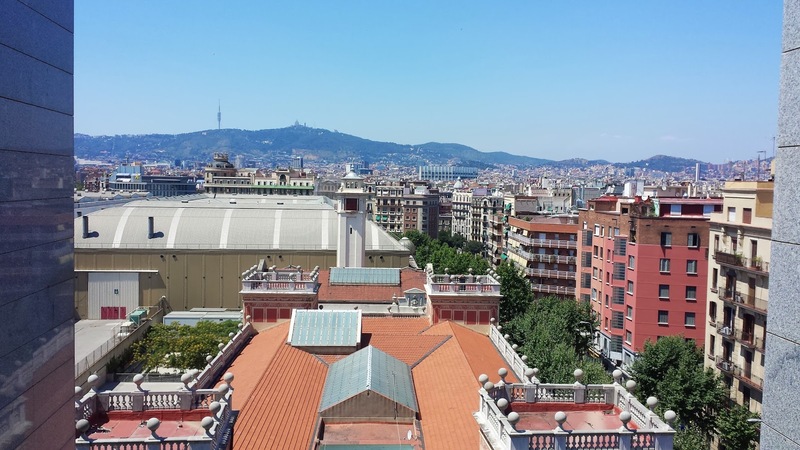 Hola from Barcelona, where 500ish of us are telling each other about the latest research in the field of morphology (like anatomy, but broader, deeper, more explanatory; but if you prefer to think of it as anatomy that’s OK by me)! 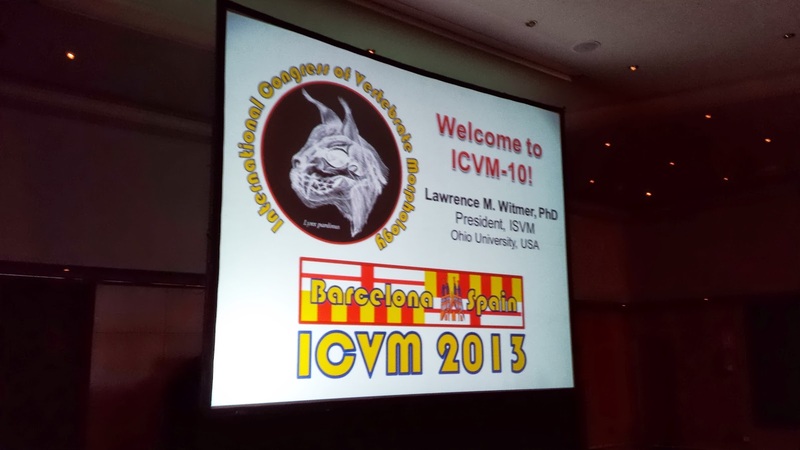 #ICVM and #ICVM2013 (favoured) are the hashtags, and http://icvm2013.com/ is the website, and there’s Facebook and all that too! You can read the full programme and abstracts here. It’s the best damn conference in the universe and I am not remotely biased. It happens every 3 years somewhere in the world and is always chock full of 5 days of glorious new information on animal form and function and much more, with just too many interesting talks to ever be able to take it all in. I am speaking a few times and want to share a talk that is about sharing the glory of morphology in public. Morphology research, that is; please put your clothing back on! It’s a text-heavier talk than my rules-of-conference-talks normally would allow, but I’m going for it, as that makes it better for sharing because my dulcet tones will not accompany the version I am sharing online. Someday in the future, at a conference venue that is better set up for reliably live-broadcasting a talk (this is NO FAULT of the excellent organizing committee of ICVM/ISVM! ), I would just do it live, but not today, not here. The point of the talk should be obvious from the first slide (as in my last post). But I’ll presage it by saying that another subtext, which might not come through so strongly in the slides as opposed to my spoken words, is that we need to tell people that we’re doing morphology/anatomy research! We should not be shy of that label because deans or geneticists or conventional wisdom or what/whomever might say (very, very wrongly!) that it is a dead or obsolete science. Indeed, many of those discoveries such as new fossils/exotic living things with cool features, cool developmental mechanisms that produced complex structures, or insights into how organisms are able to do amazing things are implicitly morphological discoveries, but the fanfare too often goes to natural history, palaeontology, evo-devo or some other area rather than explicitly to morphology. In contrast, I too often hear people poo-pooing anatomical research as yesterday’s science. 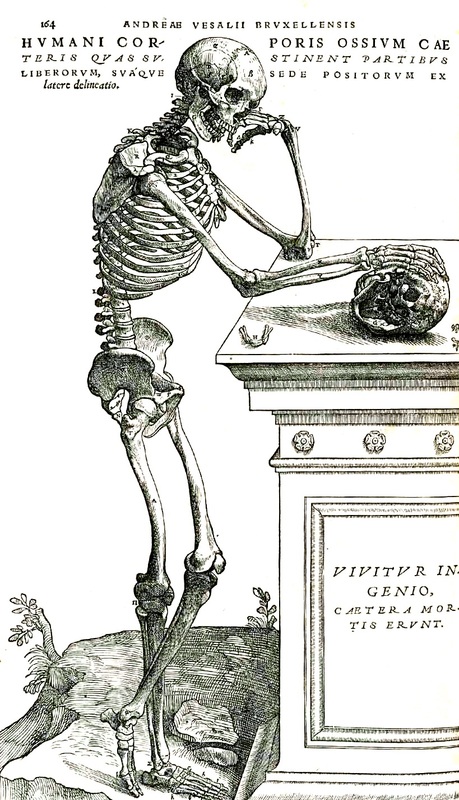 Vesalius’s classic skeleton (from Wikipedia), which is great but to me also conjures misleading connotations of anatomy as a defunct discipline that old dead dudes did. We need to sell ourselves better not only in that regard, of a renaissance of discoveries and insights in our field, but also in the sense of being in a renaissance that is driven by TOTALLY AWESOME TECHNOLOGICAL AND METHODOLOGICAL ADVANCES, especially computerized tools. We’re just as fancy in terms of techy stuff as any other biologists, but we don’t shout it from the rooftops as much as other disciplines do. And of course, as the talk is being delivered by me, you might rightly expect that I’ll say that we need to do more of this kind of cheerleading where we have maximal visibility and interaction, which includes online via social media, etc. I’ll discuss one other venue which has featured prominently here on this blog, too: documentaries. Oh I’m not done with that hobby horse, no sirree, not by a long shot!! Please discuss anything related to this topic in the Comments– I’d love to hear what you think! I am happy to clarify what my shorthand notes in the slide text mean if needed. There are links in the talk to other sites, which you can click and explore. there is a hidden social benefit in what yu are doing, which might be highlighted. Your work teaches organization of the mind around a subject. Once people could read maps – no more: they follow GPS reflexively. They are not able to verify whether the GPS is correct, nor find themselves in space. Under the guise of “making things easy”, a context is fractured into directional commands,which destroy the mental space. And the ability to do so. Anatomy is one of the few place left – for now – where people need to understand relations between organs and things. Structures and functions are being dissociated. Great talk, John, and great post. Some people apparently think that science must be just for scientists, and that science communicated over the internet via social media is immediately suspect because it is outside the staid formality of peer review. I don’t agree. In fact, that view is wrongheaded and elitist. Perhaps the greatest service that scientists can do to science itself is to engage the widest number of people about scientific matters. Indeed we professional scientists need to conform to appropriate standards of technical dissemination…but we shouldn’t limit ourselves to that. Well done, John, in pulling science out of its ivory tower. Thanks Larry, and of course I agree. I suppose we could retreat to the Victorian era and just publish papers and never have conversations– even conferences! But that is just not the reality of the modern world; that was the Victorian era. It would be a great disservice to students to tell them that science does not belong out in the open on the internet; I’d feel sorry for any that were told that, and in this modern world they’d hopefully laugh at anyone who did, anyway. The real world of humanity is inaccurate, yes, but self-correcting, too. And that self-correcting process is a teachable moment in critical thinking; the internet is great for learning that. We can isolate ourselves from that scary uncertainty or we can embrace it. It’s only every three years?! Damn, I wish I’d made it there this year! Whoops! Should have put my surname in there! 🙂 yeah save up your best stuff for 2016 ICVM in Washington DC! Hi honourable Jhone, This is Fakhrul Islam from Bangladesh. I am a Veterinarian. I have enough knowledge about Anatomy of 100 specis of animal. So, can i join this conference? Please response. Hi Fakhrul, anyone can come to ICVM if they pay the registration fees. The next one is 2016 in Washington DC so please watch the website and come! Excited to hear you are coming to Jacksonville. I keep hearing a bunch of stuff from “creationist” type people…yes, friends–believe it or not. What is the best ammo I can share with them other than “all the science” about morphology. I have tried to educate them about the evolutionary morphology but can you send me your or someone else’s best link to the obvious transitions from your standpoint. I am looking to bring as many as possible to your talk, as well. Hello Robert, and thanks- let me get back to you ASAP about the “ammo” but I wanted to let you know I saw your comment and won’t forget! Hi Robert, sorry for the delay on your main question but last week was absolutely crazy for me! My main advice is to deal with them politely and engage them based on the facts/evidence and send them to good sources so they can read more, but don’t expect them to change their minds. Indeed there are fascinating studies suggesting that more, stronger evidence merely reinforces the views of people with dogmatic, fundamentalist mindsets such as those of many creationists! Richard Dawkins annoys more than just creationists but his book “Ancestor’s Tale” has some good explanations of evolutionary transitions. and is well reviewed but I have not seen it. I would complain that there are not ideal books with huge gorgeous photos of the key fossils and explanations of those fossils in great detail, for the general public, in the way I’d like them to be explained. A lot of that stuff tends to be in the technical scientific literature and quite scattered. There are of course tons of books on fossils/evolution/palaeo but they tend to leave me disappointed in terms of showing the gorgeous sequences of fossil morphologies that we know about for so many groups and showing as many of them as feasible. I think it is just hard to get good photos without copyright issues for all the fossils in museums far-flung around the world; that’s part of the reason. But maybe others reading these comments have thoughts of the best books showing this kind of thing. My comments above are at least some OK or good examples, maybe not with those photos but at least with good text and illustrated explanations. Thank you John for the links! I was familiar with some of those arguments and with good reason, you are correct: the creationists have counter-arguments that make you think (not a bad thing) but they are very immovable. Especially the whale part. So you believe the biggest hold back from making this so evident is that the copyright photos are hard to get everyone together and make it clear and cohesive. That’s a shame. I think that it should not be so separated. It confuses so many people who, with proper evidence, might not deny what could be so easy to comprehend. Oh, btw that same friend of mine told me about a show or web video that I have not seen but is suppose to help his perspective. I think it’s called Evolution versus God or evolution vs god. I haven’t seen it and am not sure what it’s supposed to accomplish. Let me know if you hear of anything. Enjoy the Jacksonville weather! It’s morphing even as I write this. Oh no! I cannot remember, Helen! Are you sure it was from my talk? I am not sure if I have forgotten or what. I went thru my slides again and see nothing about that, so maybe I was just improvising? Sorry. on September 9, 2013 at 10:12 am | Reply What’s in John’s Pond? | What's In John's Freezer? on April 15, 2014 at 7:58 pm | Reply Anatomy: Dynamic, Not Defunct | What's In John's Freezer?